Sustainable agriculture techniques like companion planting and dryland farming were practiced for thousands of years in North America by Native Americans. Today, health problems and loss of ancestral knowledge about food and farming are common in many tribal communities. Sustainable farming is a way for tribes to get back to their roots while addressing these problems. Here are five organizations looking to their heritage for solutions to address these and other problems. WELRP produces traditional foods through the label Native Harvest, hosts conferences for indigenous farming and started Niijii Radio a station providing “independent news for an independent nation,” which carries programming in Anishinaabemowin (Ojibwe) language as well as English. Their seed library projects collect not only seeds but also grows plants to produce more seeds as well as collecting stories and videos about planting and growing. They have even re-grown forgotten strains: when an archeological dig found squash seeds in an 800-year-old clay pot in Minnesota, WELRP was able to grow 50 seeds of a squash they called Gete-okosomin (“really cool old squash”). The San Ildefonso Pueblo and other southwestern tribes have been farming since at least 125 A.D. using dry farming techniques like “waffle gardens.” The Pueblo started their farm in 2010 on a small plot in the backyard of Tribal Councilman Tim Martinez. Now there are eight acres in cultivation and many families from the community with their own fields and plots. A community-built hoop house extends the growing season. Traditional varieties of corn, beans and squash sink their roots in waffle gardens, along with onions, lettuce, carrots, okra and dozens of other crops. Elders of the Pueblo contributed knowledge to help today’s young farmers learn how to watch moon cycles and natural migration patterns to decide when to plant and harvest, and how to prepare and tend the crops as their ancestors did. Produce is sold at a farmers’ market to provide affordable, healthy and delicious food for the community. The Tohono O’odham Nation is in the middle of the Sonoran desert, near Tucson, AZ. The group’s work focuses on food systems, health and cultural revitalization. TOCA’s “New Generation of O’odham Farmers” program trains community members in the cultivation of traditional and non-traditional crops. The Desert Rain Cafe opened with a goal to make these healthy, traditional foods more easily available to the community. 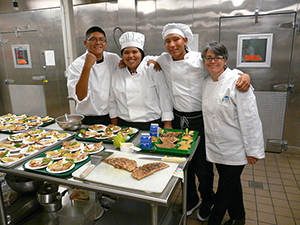 TOCA also worked with Tohono O’odham school cafeterias and Sodexo, the school food service provider, to create healthy weekly menu options based on traditional foods. Based in Okmulgee, OK, the MFSI uses sustainable agriculture, as well as cultural education and community, to empower Mvskoke (Muscogee) people to provide for their own food and health needs. The Mvskoke originated in the southeast US, where seasonal floods of creeks and streams provided fertile conditions for agriculture, before their forced relocation (the Trail of Tears) to what is now Oklahoma. The MFSI offers regular cooking classes for traditional foods like blue corn dumplings and sour cornbread, and coordinate with the Kerr Center for Sustainable Agriculture to offer free beginners’ farming and ranching classes, open to the community. They also worked with the government of the Muscogee (Creek) Nation to set up the Muscogee (Creek) Nation Food & Fitness Policy Council, and have established a farmers’ market and a seed bank.